The other day a friend of mine asked me a very profound question: "What the hell is a statement making piece and what is so statement-y about it? Ever other fashion blogger I see is using this word 'statement'. It's like you people have run out of adjectives to use nouns instead!" As much as I wanted to point blank deny our obsessive use of the word 'statement', I just could not. I have to admit, the denizens of fashion blogosphere do use this term quite frequently and let's be honest quite loosely as well. From an eye catching blazer to a pair of everyday sneakers with neon lace, a whole lot of people use the term 'statement' to just about describe anything. Here's the thing, before one can claim that he/she is wearing a statment making piece, let us understand what really does the word 'statement' mean from a fashion and styling perspective? 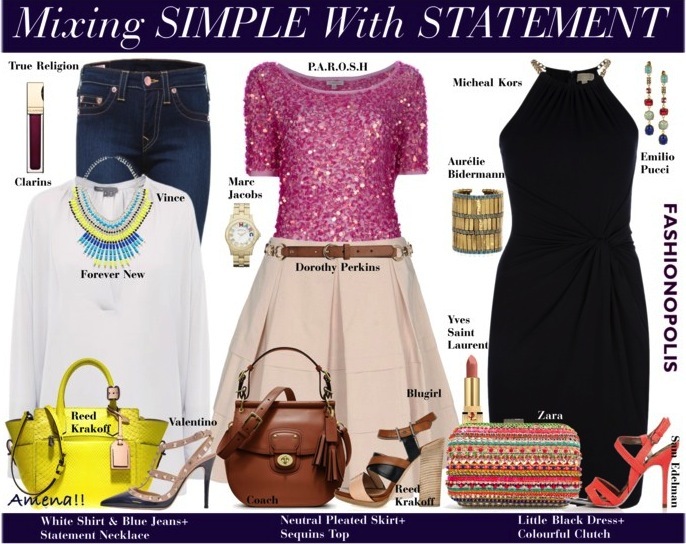 In simple terms, 'statement' is often used to describe any piece of garment or accessory that is the attention grabbing, all-eyes-on-me piece of the entire ensemble. While some are comfortable in wearing statement making pieces such as neon top or embellished jeans, I prefer to flaunt a statement accessory or jewellery. Personally I am comfortable wearing one statement piece at a time. But there are some fashion mavens who have mastered the art of effortlessly mix two or three statement pieces in one ensemble. One of my all time fave styling combination is mixing trendy statement elements with simple, classic pieces. F.Y.I. Just like statement does not mean GaGa-esque, similarly simple does not mean plain or boring. These are clothes/accessories that don't scream for attention and are not the 'look at me' piece/s of the ensemble. Look 3: MICHAEL Michael Kors Dress, Zara Clutch, Sam Edelman Sandal, Aurélie Bidermann Cuff, Emilio Pucci Earrings, Yves Saint Laurent Lipstick. The above three looks combine classic, evergreen styles with a statement element/s. The purpose of pairing a statement piece with a classic combination or simple outfit is to enhance the look without taking away from its original charm. Since statement piece is an all eyes on me, attention grabing piece, it is best to wear it around an asset. Whether it is a garment, accessory or jewellery, you should opt for a statement piece that will not just complement your body type and skin tone but also flatter your personality. What is your favourite statement piece? And how do you like to style it? Share your views with me in the comment section. lovely post. I love the necklace you are wearing. Drop by my blog sometime. 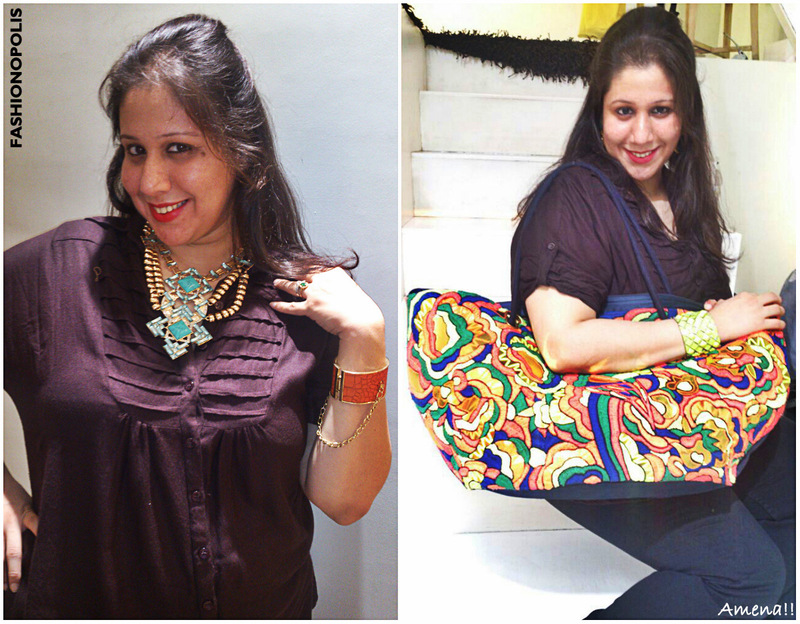 Love the neckpiece Amena! It's love at first sight! I agree, statement is overused beyond belief, but most fashion jargon is. It's a shallow world, ha ha. And I agree, if you're going to wear a statement piece, let is stand out. Don't wear multiples :) I like your writing would you like to follow each other? Thanks for explaining 'statement' but don't you agree that it totally depends on audience to decide which one is and which one is not. Just a thought, something which is statement for me might be a silly attempt by others and vice versa...I just feel a bright and shiny piece in a dull outfit makes it statement already ... Loved your post :) You look great ! !